This may easily be one of the best hostels in town. It has a big common room with comfortable sofas and a game's room which serves as a second common room. However, if they put you in a dorm on the ground floor you're out of luck, as you have the street right outside and the game's room adjacent. In the high season and especially in the weekend you may find it hard to sleep. Also, you have to pass through the game's room and common room and reception to go to toilet, and showers upstairs only. 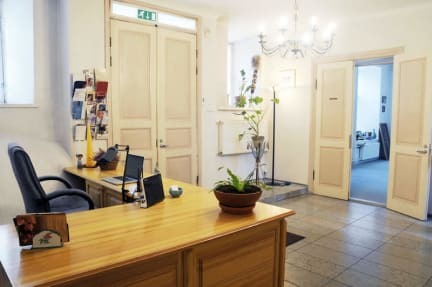 I stayed in a hostel for 2 weeks while searching for an apartment, it is a very lovely hostel, nice hangout area, staff is nice, location is perfect. I would recomend this hostel. I stayed here for two nights; the location was perfect for exploring the Old Town! The dorm bed was incredibly comfortable, and despite the dorm room being on the ground floor next to the street it was still quiet enough to get a good night's sleep. The facilities were good and the staff helped answer any of my questions. Not a very lively hostel, so if you want to meet new people maybe stay somewhere else, but a great quiet place to return to after a long day sightseeing. Would stay again. All around okay, but, note that if you are staying on the 1st floor, you will have poor access to wifi, if at all. Found the door to our room unlocked quite often, but at least they had lockers to store our stuff. The location is perfect! Right in the middle of Old Tallinn, you are within walking distance to lots of historic looking buildings and such. Overall, I would recommend it, but if they try to give you a place on the 1st floor, you should ask if they have any beds on the 2nd floor or up. I chose this hostel because of the great location and the price. The pictures were questionable when I found it but for some reason the other hostels in Old Town seemed like party hostels from their pictures. Our room was on the first floor next to the lobby facing the street so it was a bit noisy. Our room was also stuffy and had some smelly people in it which was unfortunate. The overall place is worn down and not the cleanest. I mean it gets the job done but I wouldn’t stay there again. Great location in the old town. But unfortunately there were just a few bathroom facilities which were relatively old, some were broken and not clean. Furthermore, the staff were organized but not very friendly either mindful. For one night fine because of the cheap price but not longer. Could be easily improved by a more caring service. Bottom line - if you’re not on a tight budget and can afford somewhere else, do that instead! The location was fantastic and for the price it was an easy option, especially because there aren’t many other hostels (from my research). The hostel itself wasn’t very clean (especially the kitchen) and the beds were not very comfortable. Also, the rooms didn’t feel very secure as the doors didn’t lock when pulled closed every time so often door rooms were left open (but there were lockers). There are BED BUGS in this hostel. I got several bites that itched a lot. To avoid transporting bed bugs to our home, I and my two children who accompanied me had to go straight to the sauna not far from our house. We had to put all out clothes and travel gear in plastic bags and leave them in sauna for 4 hours. Some sensitive stuff we had to put into freezer for 10 days. When I contacted the hostel about bed bugs, they did not answer. It seems that they don't want to deal with the problem.